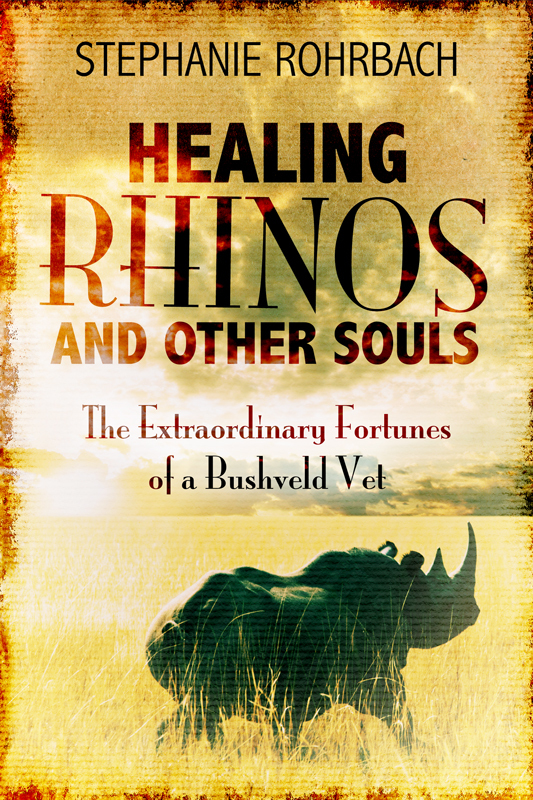 Richard Wadley has been so kind to include “Healing Rhinos and Other Souls” into the Books section of the Waterberg Nature Conservancy’s website. To have a look, please click here. He has also written a fabulous review for the Waterberg Nature Conservancy’s Newsletter January 2014. For the newsletter, please click here. Whenever anecdotes about vets are mentioned, people of a certain age are bound to be reminded of the innumerable stories of Alf Wright – alias James Herriot – the author of over 20 books (beginning with “If Only They Could Talk”, in 1970) about sick animals, sick owners and their treatment in the Yorkshire Dales. Personally, I found many of those stories rather contrived, especially after the first couple of volumes, and soon stopped reading them. Now at last comes a book about the experiences of a vet that not only seem very real, but which are also about the area in which we live – the Waterberg. Healing Rhinos (the title aside), is the wonderful story of the life of a beloved and highly competent, if occasionally unorthodox vet many of us living in and around the Waterberg were fortunate to have known: the late Dr Walter Eschenburg. Walter was and still is regarded as having been one of those truly exceptional vets, who had an innate empathy for animals big and small, wild or domesticated; who (with few exceptions) almost immediately developed a reassuring communication with them; and who would apply his considerable intellect and veterinary skill to finding solutions to their maladies, using whatever equipment and material he had at his disposal. But Walter was not only a fine vet. He was a remarkable person too. He loved people (including his delightful wife Topsy and their family), nature, the environment, humour, conversation, problem solving, teaching, story telling – and good food. In some respects, he was too good for his own good, too modest, too self-effacing, and there were those who took advantage of these attributes, failing to pay him for his services. Stephanie Rohrbach, a qualified vet herself, German-speaking like Walter and an old family friend, set out years ago to capture Walter’s history and his often outrageous, even unlikely, but always amusing stories. Walter knew that his experiences needed to be recorded for posterity and co-operated willingly with Stephanie’s project. The result is this new book, published, sadly, four years after Walter’s premature and unexpected passing. The content is a blend of first and third person memoirs, cleverly compiled, with an easy flow, if a little repetitive in places. While acknowledging the subject’s few shortcomings, like his difficulty with financial administration and his inability to drive slowly, the book is unashamedly a eulogy to a dear friend. As the author notes in her foreword, “This is not a work of fiction, nor is it, strictly speaking, a biography. It is a life-story, a memoir, and a collection of anecdotes. It is a story told by many voices, a picture painted with words. It is my picture of Walter”. It commences with Walter’s childhood, when in 1939, his family unfortunately chose to visit Germany from South Africa for a family reunion – and ended up having to remain there until the end of World War Two. This section offers a fascinating perspective of the conflict through the memories of a child; and his travails provide a glimpse of the strength of character of the man he was to become. After the family’s safe return to SA, the book moves on to describe Walter’s affinity for animals on his father’s farm on the Highveld, leading to his decision to study veterinary science and to go into private practice. Along the way, he had the great good fortune – he was always saying how fortune smiled on him – to meet and marry Topsy Graham, a beautiful young farmer’s daughter and agricultural college graduate. Off went the young couple to their first practice, in Potgietersrus (now Mokopane). And then the stories really began: wild Brahman bulls, reprobate buffalo, lucky escapes, inquisitive elephant, failed tranquiliser darts, cows in calf, a confused circus lion – and another that disappeared, escapades in a succession of clapped-out vehicles, unusual house guests, hungry (and other) snakes, ingenious improvisations and more, tumbling off the pages in rapid succession: the best fireside tales ever. Get a life, James Herriot! The book’s title is misleading: although there are a couple of stories about rhino, there are so many other fascinating and arguably more rewarding tales told in this absorbing, engaging volume it is a pity the author chose the over-used rhino theme to brand her work. Many indeed were the souls – reptilian, avian and mammalian (including human) – that were bolstered, saved or redeemed during the course of this wonderful gentleman’s career and life, aided and abetted by Topsy and his able assistants Paraffin, Flying Machine and George, as they moved first to Naboomspruit (Mookgophong) and later, to Vaalwater. We can be grateful for the memorable colourful thread Walter Eschenburg wove through the Waterberg tapestry. And we must thank Ms Rohrbach for having brought so many of his entertaining anecdotes together to paint an accurate portrait of his character, for the enjoyment of all of us who love the world he loved. This entry was posted in Uncategorized and tagged book, healing rhinos, James Herriot, nature, review, Walter Eschenburg, Waterberg on February 25, 2014 by Peppertreechronicles. “Healing Rhinos and Other Souls” has been out for a while now and, to be honest, it’s all been quite overwhelming. Thank you so much to everyone for taking the time to read it, for your comments and great reviews, and for all your support in so many ways! “Healing Rhinos and Other Souls….” is available as paperback from Amazon (amazon.com, amazon.de, amazon.co.uk, etc) and Kalahari. As e-book it can be found on Amazon/kindle, iBooks, kobo and all the other usual suspects. This entry was posted in Uncategorized and tagged book, healing rhinos, thank you on February 23, 2014 by Peppertreechronicles.